현재 사용자의 언어 태그를 반환합니다.Returns the language tag of the current user. Language 함수는 현자 사용자의 언어, 스크립트 및 지역을 언어 태그로 반환합니다.The Language function returns the language, script, and region of the current user as a language tag. 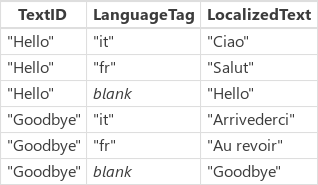 언어 정보를 사용하여 로캘 간에 앱을 조정합니다.Use the language information to tailor your app across locales. 예를 들어 이탈리아와 프랑스에서 사용할 앱을 만드는 경우 Language를 사용하여 다른 위치에 있는 사용자에게 이탈리아어와 프랑스어 문자열을 자동으로 표시할 수 있습니다.For example, if you are creating an app that will be used in Italy and France, you can use Language to automatically display Italian and French strings to your users in those different locations. "lg‑RE""lg‑RE" lg는 언어에 대한 두 자의 약어이고 RE는 지역에 대한 두 자의 약어입니다.lg is the two character abbreviation for the language and RE is the two character abbreviation for the region. 가장 일반적인 반환 형식입니다.This is the most common return type. 예를 들어 "en-GB"는 영국에 대해 반환됩니다.For example, "en-GB" is returned for Great Britain. "lg""lg" lg는 언어에 대한 두 자의 약어입니다.lg is the two character abbreviation for the language. PowerApps에 언어에 대한 정보가 있지만 특정 지역에 대한 정보는 없는 경우 사용하는 형식입니다.This is the format used when PowerApps has information about the language, but does not have information for the specific region. "lg‑scrp‑RE""lg‑scrp‑RE" lg는 언어에 대한 두 자의 약어이고 scrp는 스크립트에 대한 네 자의 약어이며 RE는 지역에 대한 두 자의 약어입니다.lg is the two character abbreviation for the language, scrp is the four character abbreviation for the script, and RE is the two character abbreviation for the region. PowerApps는 IETF BCP-47 언어 태그 형식을 사용합니다.PowerApps uses the IETF BCP-47 language tag format. 수식 입력줄 또는 고급 뷰에서 지원된 언어 태그, 형식 Value( "1", ) 목록을 보려면 두 번째 인수에 대해 제안된 로캘의 목록 전체를 스크롤합니다.To see the list of supported language tags, type Value( "1", ) in the formula bar or advanced view and scroll through the list of locales suggested for the second argument. Text 및 Value 함수 모두 언어 태그를 사용합니다.The Text and Value functions also use language tags. 전역적으로 인식된 방식으로 텍스트 문자열을 변환하는 데 이러한 함수를 사용합니다.Use these functions for translating to and from text strings in a globally aware manner. 언어 태그를 이러한 함수에 전달하고 지역에 차이가 없으면 태그의 언어 부분만 사용하면 됩니다.When passing a language tag to these functions and the region would not make a difference, you can use just the language portion of the tag. 호스트 운영 체제 및/또는 브라우저가 위치에 대한 기본 로캘을 사용한다고 가정합니다.It is assumed that the host operating system and/or browser are using the default locale for the location. Language()Language() 리스본, 포르투갈Lisbon, Portugal "pt-PT""pt-PT"
Language()Language() 리우데자네이루, 브라질Rio de Janeiro, Brazil "pt-BR""pt-BR"
Language()Language() 애틀랜타, 미국Atlanta, USA "en-US""en-US"
Language()Language() 맨체스터, 영국Manchester, Great Britain "en-GB""en-GB"
Language()Language() 파리, 프랑스Paris, France "fr-FR""fr-FR"
Language()Language() 로조, 도미니카Roseau, Dominica "en""en"
지역화를 위한 간단한 접근 방법은 작성자가 정의한 TextID를 사용자 언어의 번역된 텍스트에 매핑하는 Excel 스프레드시트 매핑을 만드는 것입니다.A simple approach to localization is to create an Excel spreadsheet mapping an author defined TextID to a translated text for the user's language. 이 테이블에 대해 다른 데이터 원본이나 컬렉션을 사용할 수는 있지만 번역사가 앱 외부에서 쉽게 편집하고 관리할 수 있는 Excel을 선택했습니다.Although you could use a collection or any other data source for this table, we chose Excel because it is easy to edit and manage outside of the app by translators. 지정된 언어에 대해 특정 텍스트 문자열이 발견되지 않으면 Language 열이 공백인 항목이 기본값으로 사용됩니다.The entry with blank for the Language column will be used as the default if there is no specific text string found for a given language. 이 항목은 주어진 TextID에 대한 다른 모든 항목 다음에 나타나야 합니다.This entry must appear after all other entries for a given TextID. 목적에 맞게, 지역이 아닌 로캘의 언어를 확인해야 합니다.For our purposes, we only need to look at the language of the locale and not the region. 지역별 고려 사항이 중요한 경우 위 테이블에 전체 언어 태그 값을 포함할 수 있습니다.If regional considerations were important, we could have included the full language tag value in the table above. Insert 리본, Table 명령을 사용하여 적절한 Excel 테이블로 만듭니다.Use the Insert ribbon, Table command, to make this into a proper Excel table. 기본적으로 이름은 Table1이지만 왼쪽 멀리 있는 테이블 도구/디자인 리본과 테이블 이름: 텍스트 상자로 원하는 이름을 지정할 수 있습니다.By default, it will be named Table1 but you can name it whatever you like with the Table Tools/Design ribbon and the Table Name: text box on the far left hand side. 로컬 파일 시스템에 Excel 파일을 저장합니다.Save the Excel file to your local file system. 오른쪽 창의 PowerApps에서, 데이터 원본 탭을 클릭하거나 탭한 후 데이터 원본 추가를 클릭하거나 탭합니다.In PowerApps, in the right-hand pane, click or tap the Data Sources tab, and then click or tap Add data source. 앱에 정적 데이터 추가를 클릭하거나 탭하고, 저장한 Excel 파일을 클릭하거나 탭한 다음, 열기를 클릭하거나 탭합니다.Click or tap Add static data to your app, click or tap the Excel file that you saved, and then click or tap Open. 생성한 테이블을 선택한 후 연결을 클릭하거나 탭합니다.Select the table that you created, and then click or tap Connect. 이 수식은 사용자의 언어에 해당하는 적절한 LocalizedText를 조회하고 없는 경우 기본 공백 버전에서 대체(Fallback)합니다.This formula will lookup the appropriate LocalizedText value for the language of the user, and if that is not found, will fall back on the default blank version. 다른 언어로 번역된 문자열은 자신의 언어보다 훨씬 오래 걸릴 수 있습니다.Be aware that translated strings in other languages could be significantly longer than they are in your language. 대부분의 경우 사용자 인터페이스에 문자열을 표시하는 레이블 및 기타 요소가 더 넓어져야 합니다.In many cases, the labels and other elements that display the strings in your user interface will need to be wider to accommodate. Microsoft Translator를 클릭하거나 탭합니다.Click or tap Microsoft Translator. Microsoft Translator 서비스는 Language 함수에서 반환하는 동일한 언어 태그를 사용합니다.The Microsoft Translator service uses the same language tags that the Language function returns. 번역 작업을 완료하는 데 시간이 걸리므로 네트워크를 통해 서비스를 호출해야 합니다.The translation will take time to complete, requiring a call to a service across the network. 이렇게 하면 앱의 번역된 텍스트가 지연되어 표시됩니다.This will result in a lag to see the translated text in your app. 번역은 기계적으로 이루어지므로 예상한 내용이 아니거나 앱 내의 상황에 가장 적합한 번역이 아닐 수 있습니다.The translation will be mechanical and may not be what you anticipate or be the best choice for the situation within your app.